Bob was emphatic. Grab your morning cup of coffee and be at my place at 5:00 a.m., and we’ll be on our way. He said it looks to be a perfect morning with just enough wind for the dog to catch a scent and a light frost. “We should get in them”, he said with his clinched cigar grin. 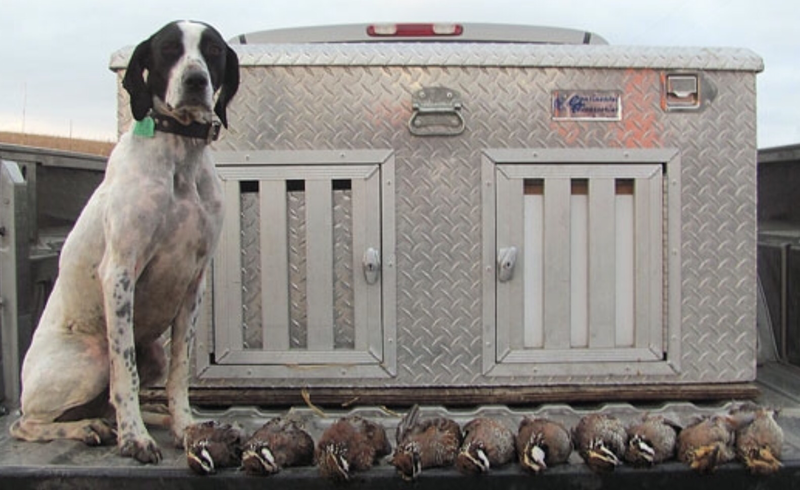 I jumped at the opportunity to enjoy a quail hunt in north Missouri with my early mentor and arrived on time. We hopped in Bob’s Silverado and turned onto M-13 for the drive to the Bethany area, where his family farm awaited us. Money was tight in those days, and my bird gun was a newer 870 Remington, improved cylinder 12 gauge. It may as well have been an engraved Perrazi, replete with knurled Italian walnut. I was careful with the shotgun, keeping it cased until the dog was out and the hunt began. When I arrived at Bob’s house, he instructed me to throw my shotgun in the bed of the truck, behind the dog box, and asked if I needed a coffee refill. I accepted his offer and began nursing the strongest cup of black coffee I have ever drank. I did not see Bob’s shotgun in the back of the truck, but was not concerned. The bed was not the only place in the big Silverado to secrete a shotgun. The conversation was as expected. The sage old Zone Sergeant and his eager scribe engaged in banter about the things that were important in that day. I became familiar with the differences between a Homelite and Poulan chainsaw, important as I was considering the Poulan’s price advantage. “Poulan is a pulp wood chainsaw”, muttered Bob, “real good on pine in the Mississippi swamps, won’t last on Missouri hardwood”. We talked about patrol cars, and our affable and tough circuit judge, Roger Slaughter. We talked at length about the Patrol, but I don’t recall the specifics of that conversation. Bob was a country philosopher and a keen judge of people, you could take him to the bank when he talked about the personalities in Lafayette County, on both sides of the law. Understanding people was his strength. We finally arrived at “the farm” and I immediately began sizing up the ditches and fence rows, taking judicial notice of a couple of particularly menacing, hulking Angus bulls that were eyeing us with suspicion. We exited the truck and turned the dog out as Bob retrieved his shotgun, a battered old 12 gauge, Browning Automatic. I was stunned to learn that I had been resting my feet on the shotgun as it was in the floorboard of the truck, under a half dozen paper feed sacks! Bob blew the dust and grit off the shotgun and fed it three loads of 7 1/2’s. He was grinning broadly as I carefully uncased the 870 and fed it. I was grinning too, there was nothing to be said! We hadn’t gone far when his long legged pointer locked solid at the edge of a ditch. Bob sent me in to flush and I hadn’t taken ten steps when a nice covey exploded, the birds were jittery and in a hurry to avoid us. Concentrating on a single bird when twenty are up is a skill that only good wing shooters have, but somehow I was able to focus and knock a rooster down. The bird elected to glide a bit, with a leg down, before falling into the pasture where the aforementioned bulls were stationed. Nice. Bob assured me the bulls were gentle and I slipped carefully under the electric strand that served as their temporary fence. I walked gingerly over, picked the bird up and the show began. One of the bulls took exception to me, my orange vest and/or attitude and decided that I would be fun to trample (I am guessing here on the bull’s intent). A quick calculation suggested the electric fence was my best option and the race was on. I made it to the fence with no time for the low crawl negotiation that got me into the bull’s paddock, and attempted to gingerly step over the strand. I would have been better off taking my chances with the bull. I have never seen Bob laugh as hard as he was laughing as I was unceremoniously being electrocuted by the strand that I was straddling. My shotgun received it’s first scratches and my leg, as I write, is twitching just a little as I recall my brush with death. Bob and his venerable old Browning had scored a clean double on the covey rise, both birds dropping in the lane adjacent to the ditch. Bob was very measured in his gait but could flat out shoot. We ended the day with 10 or so birds between us, enjoyed lunch at an eatery that has long since escaped my mind, and started back just before dark. It was a tremendous day shared between two men with common interests who were both living the life we wanted to. It was our only hunt. The Highway Patrol, in those days, was a cruel mistress. We did not have the Fair Labor Standards Act to protect us from the inevitable overtime necessary to get the job done. With absolutely no regret, I can remember many weeks that we worked 60 hours. The unstated commitment that our generation made to the Patrol left little time to enjoy activities together in a zone beyond the occasional bar-b-cue or dinner. I was fortunate to enjoy the guidance and friendship of Sgt. Robert (Bob) Plymell for 5 too short years before we drifted apart as our careers took different trajectories. Bob Plymell was a credit to the Highway Patrol and the hard working farm culture of rural Missouri……. ……..and one hell of a wing shooter. I wonder where that old Browning is today.